Facebook may have a minimum user age of 13, but 67.3 percent of posts on the social network are written at much younger reading levels -- fifth grade or below -- according to a study of 5,804 pages with more than 1,000 likes apiece, and 1,578,006 total posts, by digital intelligence firm TrackMaven. Facebook may have a minimum user age of 13, but 67.3 percent of posts on the social network are written at much younger reading levels — fifth grade or below — according to a study of 5,804 pages with more than 1,000 likes apiece, and 1,578,006 total posts, by digital intelligence firm TrackMaven. 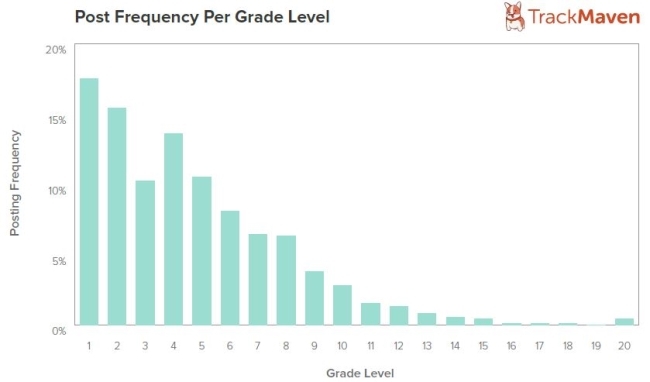 TrackMaven said it used the Flesch Reading Ease formula, which scores passages on a scale of 0-100, with 90 through 100 representing an 11-year-old student, and zero through 30 translating into a university graduate reading level. The company found that 67.3 percent of Facebook posts were written at reading levels of fifth grade or below, with first grade accounting for the most, at 17.5 percent. Meanwhile, only 2.5 percent of posts were written at or above college reading levels. 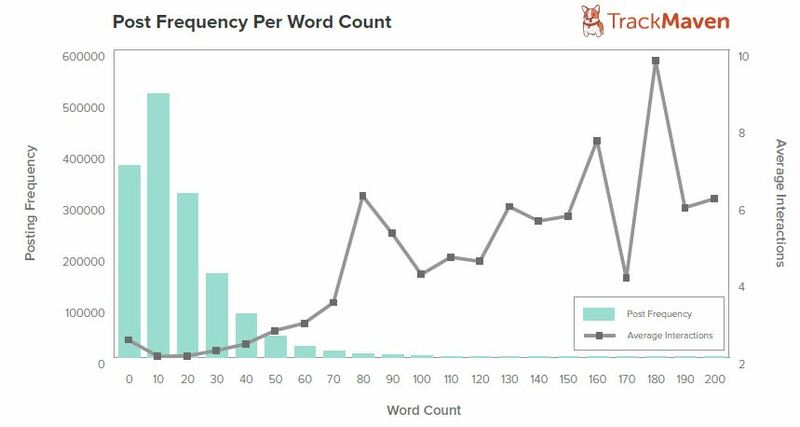 TrackMaven also found that the most common word count in Facebook posts was 10 to 19 words, occurring 33.09 percent of the time. This was followed by zero to nine words (24.12 percent), and 20 to 29 words (20.58 percent). A total of 93.77 percent of Facebook posts had word counts of 49 or fewer, and 57.21 percent were at 19 or fewer words. 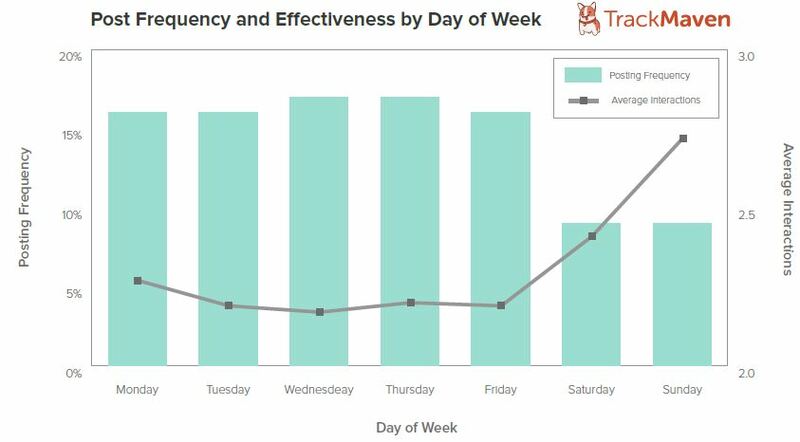 And TrackMaven took its crack at determining the days of the week and times of the day that were most popular and most effective. Weekends did not fare well, with 9.04 percent of posts published on Saturday and 8.73 percent on Sunday. 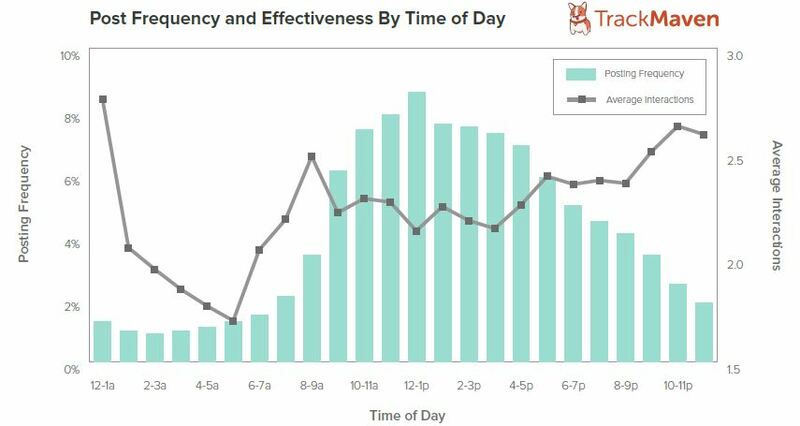 In terms of effectiveness, the average number of interactions per post was fairly consistent during the five days of the work week, and they peaked on Sundays, with 2.72 average interactions per post. The most popular time of day to post is between noon and 1 p.m., when 8.55 percent of posts were published, and the least popular times, not surprisingly, were 2 a.m. to 3 a.m. (0.91 percent), 3 a.m. to 4 a.m. (0.95 percent), and 1 a.m. to 2 a.m. (1.01 percent). Interactions trended upward after the work day ended, averaging 2.49 between 5 p.m. and 1 a.m.
88 percent of posts contained photos. Fewer than one out of every six posts contained hashtags, but those posts saw 60 percent greater engagement. Posts containing exclamation points saw an average of 2.7 times more engagement. Only one out of five posts used question marks, but they saw 23 percent more engagement. Readers: Did any of TrackMaven’s findings surprise you? 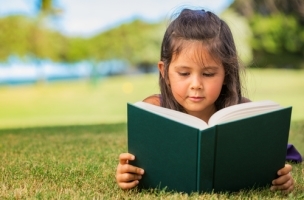 Image of little girl reading courtesy of Shutterstock.